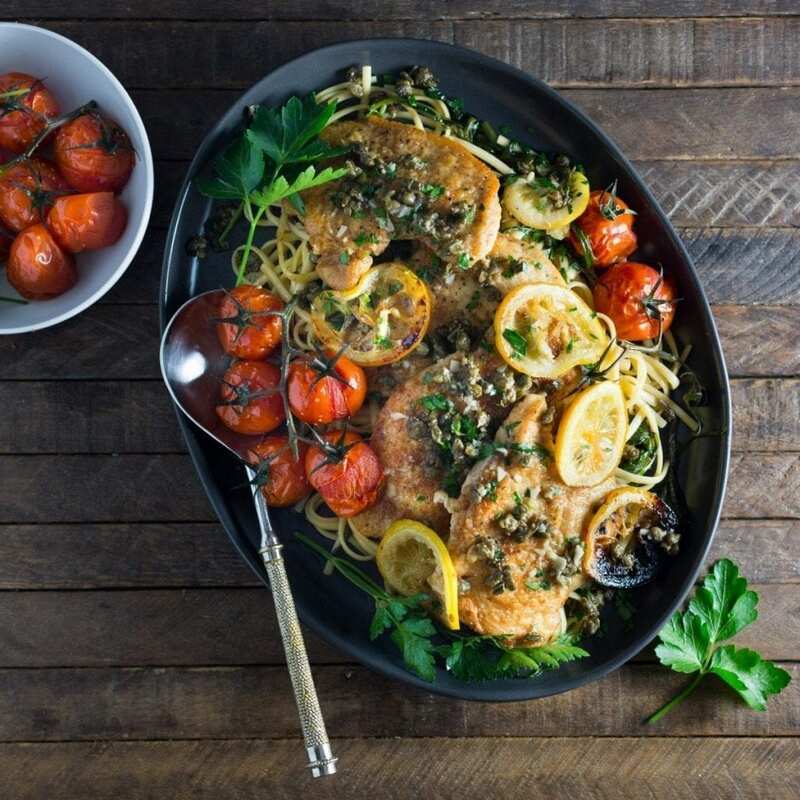 Fresh tomatoes, fried capers and butter-lemon flavors combine with chicken cutlets to create this perfect zingy summery piccata recipe. We served it over linguine, but grilled bread would also be a good option. Very early summer can be frustrating for a cook. The garden beds are filled with all our favorite vegetables. We planted six different kinds of tomatoes, chard and kale, loads of garlic, eggplants, tomatillos, jalapeños, broccoli rabe.But nothing is even close to ready yet. They’re all just beginning to sprout and bloom, so it will be at least a month before anything can be harvested, except for the herbs which are happily taking over the back deck. So while our bounty is bounty-ing, it’s back to the grocery store to see what looks good. We found pretty, if not very sweet, tomatoes, still on the vine and perfect for a quick roasting. Just 15 minutes in a hot oven concentrated the flavor and turns them jammy and soft. A perfect accompaniment to bright, zingy Chicken Piccata. I love Chicken Piccata because it combines all my favorite: lemon, garlic, capers and parsley. We do something just a little bit different and fry the capers, which makes them crisp up and mellows them a bit. Our parsley is growing beautifully already. The leaves are huge! Lemon, capers, garlic and parsley would also make a great sauce for grilled or baked fish. Capers are flower buds from a plant called capparis spinosa. The buds are picked before the plant flowers, then they are either brined or salted, similar to olives. If the bud is left, it blooms in to a purple and white flower. Once the flower falls off, a fruit called the caperberry grows in its place – these look like large, tear shaped capers. Brined capers need to be rinsed and dried before frying. Piccata is a dish that’s all about balance. The lemon should be bright and tart, but not puckeringly sour. The capers should have a salty bite, but not overwhelm. The sauce should be buttery but not greasy. I like to add just a tiny bit of honey which mellows everything out a little. Taste as you go because some lemons are sweeter than others so you may not need any honey at all. I also dredge the chicken cutlets in a mixture of flour and Parmesan, which gives them a light but crisp coating that soaks up the lemony sauce. Omg, so good. I love roasted or grilled lemons so I decided to roast some slices along with the tomatoes. You could certainly leave them raw if you’re not doing the tomatoes, but I love how they taste when they get a little brown. Tomatoes and lemon slices, drizzled with olive oil and ready for roasting. Tender chicken cutlets in a bright, lemon-butter sauce, topped with crispy fried capers. Roasted tomatoes and lemons are a modern addition. Place tomatoes and lemon slices on a baking sheet in a single layer. Drizzle on olive oil and season with salt and pepper, to taste. Roast until tomato skins split a little and lemon slices are lightly browned, about 10-15 minutes, depending on the size of the tomatoes. Set aside. Cut each breast in half horizontally to make thinner. One at a time, add pieces inside a heavy sealable bag and pound to make them ½ inch thick. Combine flour, cheese and pour onto a plate. Season chicken with salt and pepper. Dredge chicken pieces in the flour mixture and shake off excess. Heat a large skillet over medium-high, add the olive oil. When shimmering, add the capers and cook for about 1-2 minutes, until they open up a bit and brown a little. Remove the capers with a slotted spoon and and let drain on a paper towel. In the remaining oil, add chicken in a single layer but don’t crowd the pan, cook in batches if necessary. Cook until golden brown, about 2-3 minutes. Flip and brown the other side, about 3 minutes, until fully cooked. Remove and transfer to plate. Cover with foil to keep warm. Repeat with the rest of the chicken, adding little more oil, if needed. Once all the chicken is cooked, reduce heat to medium and add garlic. Cook for 30 seconds then add the lemon juice, stock, honey, and wine. Bring to simmer, scraping up any brown bits from the pan. Cook until reduced by half, about 4-5 minutes. Taste for seasoning and add salt and pepper as needed. Stir in the butter until melted. The sauce should be slightly thick and glossy. Slide the chicken back into the pan and coat with the sauce. Sprinkle over the parsley and capers, and serve immediately with the roasted tomatoes and lemons on the side. This sounds fabulous. I make a version of chicken piccata about once a week. Sometimes I add marsala instead of white wine. Sometimes I add marinated artichoke hearts to the mix. I am lucky enough to have a glorious lemon tree here in SW Florida so there is no shortage of citrus. I cannot wait to try your version. Wow, I love the idea of using Marsala! That would be fantastic, especially with a side of roasted or grilled mushrooms. I’m very jealous that you have a lemon tree! What a fantastic treat. Love this- so simple and quick to make! and i love the insta-posts! am a devoted follower and big fan!! !